A professionally trained cook turned stay-at-home mom, Amy Finley decided on a whim to send in an audition tape for season three of The Next Food Network Star, and the impossible happened: she won. So why did she walk away from it all? A triumphant and endearing tale of family, food, and France, Amy’s story is an inspiring read for women everywhere. While Amy was hoping to bring American families together with her simple Gourmet Next Door recipes, she ended up separating from her French husband, Greg, who didn’t want to be married to a celebrity. Amy felt betrayed. She was living a dream—or was she? She was becoming famous, cooking for people out there in TV land, in thirty minutes, on a kitchen set . . . instead of cooking and eating with her own family at home. In a desperate effort to work things out, Amy makes the controversial decision to leave her budding television career behind and move her family to France, where she and Greg lived after they first met and fell in love. 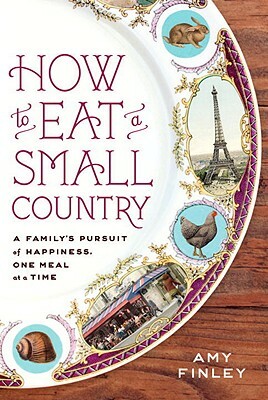 How to Eat a Small Country is Amy’s personal story of her rewarding struggle to reunite through the simple, everyday act of cooking and eating together. Meals play a central role in Amy’s new life, from meeting the bunny destined to become their classic Burgundian dinner of lapin à la moutarde to dealing with the aftermath of a bouillabaisse binge. And as she, Greg, and their two young children wend their way through rural France, they gradually reweave the fabric of their family. At times humorous and heart-wrenching, and always captivating and delicious, How to Eat a Small Country chronicles the food-filled journey that one couple takes to stay together. AMY FINLEY was the winner of the third season of the hit show "The Next Food Network Star. "After her win, she hosted Food Network's "The Gourmet Next Door." A Paris-trained cook and pastry chef, she was a regular contributor to "Bon Appetit." She lives in San Diego, California, with her husband and their children.